educational award, but also could be new work with a large establishment. 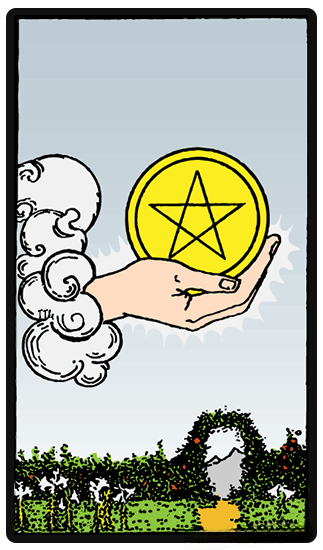 The Eight of Pentacles card depicts a young man who is etching a pentacle shape into the eight golden coins. The card symbolizes someone who is completely focused and absorbed in what they are doing. The town that is far in the background means that he successfully isolated himself from the distractions so that he can fully concentrate on his task. 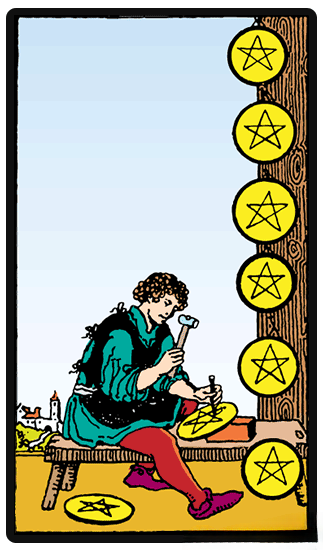 The Eight of Pentacles refers to that moments in your life when you are dedicated to completing a certain task. You are fully-immersed, and you are committed in delivering the best version of your work. The card depicts a religious figure that sits in a rather formal environment characteristic for a church. He is wearing three elaborate vestments which are designated to represent the three different worlds. His right hand is properly raised in an act of benediction, a sign of blessing – it s the same hand that the Magician has raised. In his other hand, he carries a triple cross, which is associated traditionally with the pope. Each of the horizontal bars in the cross are thought to represent the Father, the Son and the Holy Ghost. Beneath him, two acolytes are seated, representing the transfer of sacred knowledge within institutions. Through these acolytes, the card also comes to represent following the path to knowledge and education. This card is also known as the High Priest in certain decks - as well as the Pope. 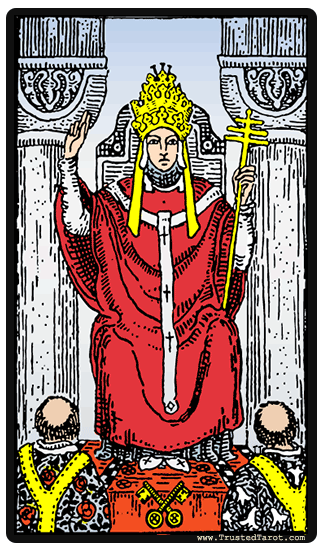 He is acting as the masculine counterpart of another card which is known as the High Priestess. This card is ruled by Taurus. information becoming known to you that works to your advantage and triumph, outfoxing the fox.